round 5,000 people packed Washington Square Park a few months ago for the Rochester March for Our Lives rally against gun violence. A year before, 2,000 people had gathered there a day after Donald Trump’s inauguration. Occupy Rochester NY in 2011 set up its encampment around the Soldiers and Sailors Monument in the downtown space. 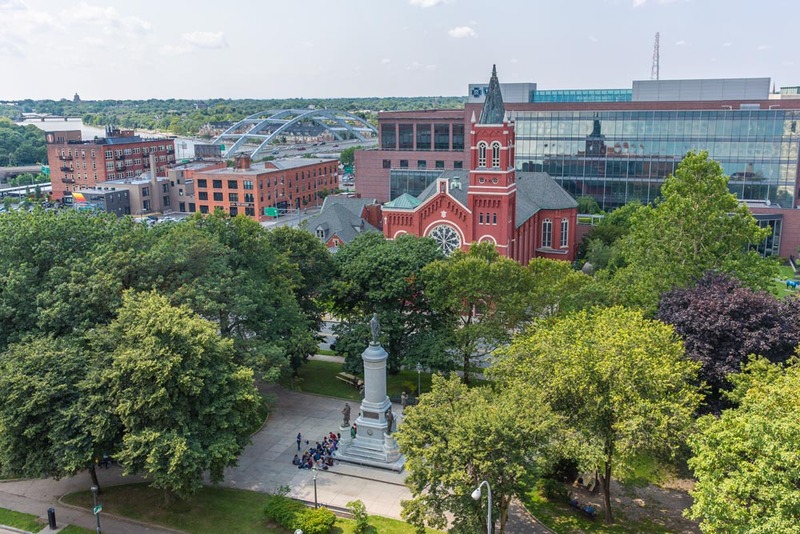 Elisha Johnson gave the square that would become Washington Square Park to the town in 1822, and for most of Rochester’s history, the space has been a natural meeting spot for rallies, marches, protests, and community events. But outside of a handful of events a year, Washington Square Park is relatively quiet. Although it’s surrounded by major businesses, two large churches, Geva Theatre Center, and several residential buildings, and thousands of cars pass on South Clinton Avenue — most driving under a big welcome to Rochester sign — the park doesn’t draw much foot traffic on most days, says Jason Schwingle, president of the Washington Square Park Community Association. While major changes to the park won’t be on the table — the space was designed by Frederick Law Olmsted — the session is open ended, from ideas for events that could be hosted in the space or how the park could be better marketed to how the park could be more accessible. The association is a non-profit group that includes residents, business leaders, and organizations from the area around the park. For its park effort, it received a $15,000 grant from the Rochester Area Community Foundation and is working with the Community Design Center Rochester and Stantec design firm. CDCR and Stantec will compile a report on the park, along with feedback from the public session, and the community association hopes to use that to leverage support from the city, Schwingle says. “We want to all see how we can live together, work together, play together, and how we can respect the park’s history and make it useful,” Schwingle says.